Curved displays are a trendy technology. Samsung and LG announced their curved phones not long ago, but the true game is not played with curved technology. This technology is just a previous step to the big game: the flexible technology. 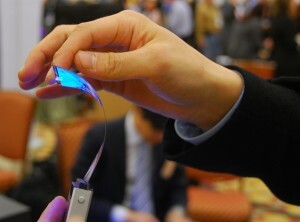 Samsung Galaxy Round and LG G Flex have set the bases for the next kind of flexible devices. Samsung is looking ahead with different ideas. Although Samsung have not announced anything official, several leaks pointed to foldable devices. The company presented the new devices to the investors, and one of the assistants talk with Phone Arena about the prototypes. Samsung demonstrated a foldable phone and a bigger device which was phone-sized but unfolded into a tablet. This is a remarkably interesting concept device, as it can mean that you can fold your tablet once or twice to a phone size. There is still a long way to go before the technology was ready, but it will come probably by 2015. Back on 2011, Samsung already managed to create a crease with a flexible OLED, which would fold and wasn’t distorting the degradation of the images on the screen. This was the first step for a real flexible display. However, it was only the display that curves. The rest of the device is fixe; the battery, the board… until we won’t have these other parts flexible, we can only dream! And Bloombers has just published that Samsung might launch another kind of device: a three-sided screen. The screen is supposed to extend all the way around the phone’s side, allowing users to view messages from an angle. Each part of the display will be operating independently. Unfortunately, both ideas are far from official and none of these is going to be here anytime soon. Still, they are different and exciting projects for the next year!